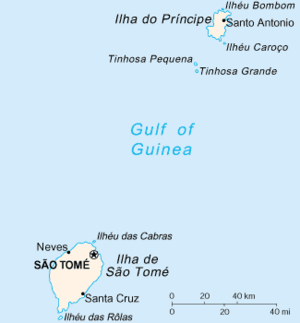 Príncipe is the northern and smaller of the two major islands of the country of São Tomé and Príncipe. It is in the sea to the west of Africa. It has an area of 136 square kilometres (53 sq mi). Close to 5,000 people live there. The island is a heavily eroded volcano over three million years old. It is surrounded by other smaller islands including Ilheu Bom Bom, Ilhéu Caroço, Tinhosa Grande and Tinhosa Pequena. Príncipe rises in the south to 948 metres (3,110 ft) at Pico de Príncipe, in a part of the Obo National Park that is covered with trees. The north and centre of the island were formerly plantations, most of them formed by Portuguese colonialists using slave labor. These concentrated initially on producing sugar and later on cocoa, becoming the world's greatest cocoa producer. Since independence these plantations have since largely gone back to being forest. This page was last changed on 14 April 2017, at 12:48.